Join Colby for this workshop designed to help you unlock your gifts in a practical and fun way! This class will be informative, evidential and provide you with a safe place to practice your intuition! Do you have trouble trusting your gut? Do you get “hits” of information and yet fail to listen to them? Do you get feelings and premonitions? Do you have dreams that come true? Can you feel the pain and emotions of others? Would you like to develop your intuition to help you with important career, financial and relationship decisions? Want to understand the signs and symbols you are receiving with greater clarity? Would you like a safe place to play & practice? This is a wonderful workshop designed to Introduce YOU to your Inuition! 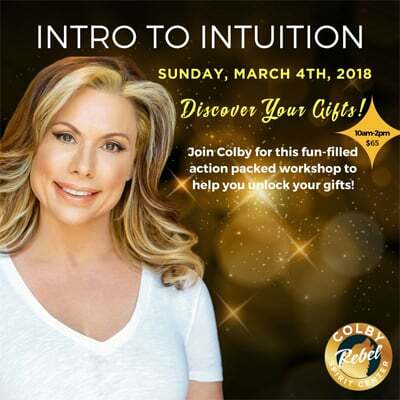 Join Colby for this action-packed workshop filled with practical exercises designed to help you tune in and trust your gifts! *NO EXPERIENCE NECESSARY! Bring along a friend or family member for a wonderful bonding experience at a discounted price! Colby is a certified master spiritual teacher, #1 best-selling author, public speaker and radio host of the hit show #LivewithColbyPsychicRebel on UBNradio.com and the FBLive inspirational show #CoffeewithColby each morning at 10:00am pst.